July 2015 | KitchenBathDesign.com | ForResidentialPros.com | 41 BLOMBERG Elm Street 2-6 Milk 34445 Instanbul, Turkey Tel: (704) 491-9854 Web Site: www.blombergappliances.us Types of Appliances: Cooktops, dish- washers, ice makers, laundry products, ovens/ranges, refrigerators/freezers. Channels of Distribution: Kitchen/bath distributors. Special Services: All products feature 1 year parts/labor warranty, 2-year parts, plus additional specifc coverages for various appliances. Circle No. 251 on Product Card BLUESTAR 600 Arlington Street Reading, PA 19611 Tel: (610) 376-7479 Web Site: www.bluestarcooking.com Types of Appliances: Cooktops, ovens/ ranges, refrigerators/freezers. Channels of Distribution: Appliance retailers, kitchen/bath dealers. Special Services: BlueStar ofers the op- portunity to customize range layouts as well as colors. The company has more than 200 color oferings. Major Products: BlueStar's open burner system on its gas ranges produces up to 25,000 BTU of cooking power. The company has rangetops, electric wall ovens, a Platinum series and freestanding ranges. Circle No. 252 on Product Card BOSCH HOME APPLIANCES 1901 Main Street, Ste. 600 Irvine, CA 92614 Tel: (866) 404-9810 Web Site: www.bosch-home.com/us Types of Appliances: Cooktops, dish- washers, laundry products, microwave ovens, ovens/ranges, refrigerators/freez- ers, ventilation/hoods, warming drawers. Channels of Distribution: Appliance retailers, direct to consumers, kitchen/ bath dealers, kitchen/bath distributors. Retailer Incentives: Go to http://www. bosch-home.com/us/special-ofers.html. Special Services: Custom panel options available with various products, includ- ing dishwashers and refrigerators. Major Products: Products include the Benchmark Wall Oven with Side Opening Door, the Benchmark Steam Convection Oven and the 24" Glass Door Refrigerator. Circle No. 253 on Product Card BROAN 926 W. State Street Hartford, WI 53027 Tel: (800) 558-1711 Fax: (262) 673-8638 Email: AskUs@BROAN.com Web Site: www.BROAN.com Types of Appliances: Disposers/com- pactors, ventilation/hoods. Channels of Distribution: Appliance retailers, home centers, kitchen/bath dealers, kitchen/bath distributors. Major Products: BROAN ofers a full line of range hoods and trash compactors. Choose from an extensive selection of styles, sizes, applications and fnishes. BROAN Elite and BROAN HVI-certifed hoods ofer quiet operation, halogen lighting and ENERGY STAR-qualifed models. BROAN Elite trash compactors feature a compact ratio of 6-to-1 bags and odor control system. Circle No. 254 on Product Card CAPITAL COOKING EQUIPMENT 13211 Florence Avenue Santa Fe Springs, CA 90670 Tel: (562) 903-1168 Fax: (562) 903-1167 Web Site: www.capital-cooking.com Types of Appliances: Cooktops, outdoor grills/BBQs, ovens/ranges, ventilation/hoods, warming drawers. Channels of Distribution: Appliance retailers. Special Services: Full customization for cooktop confgurations (all burn- ers, griddle and grill options – open or sealed burner); consumers can choose from any RAL color for complete color customization; lifetime warranty on stainless steel sheet metal body parts against rust. 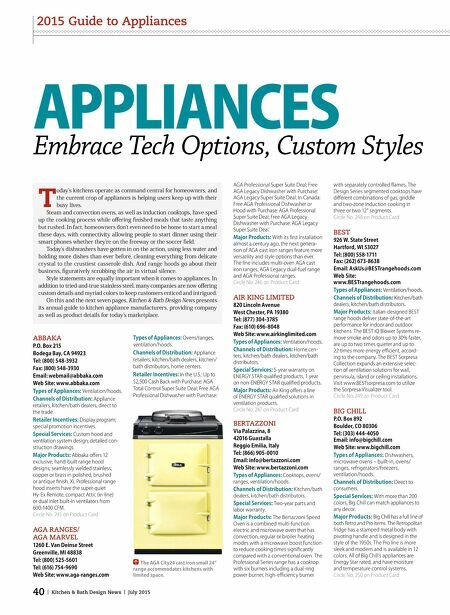 Major Products: Product lines from Capital Cooking include the Precision Series of sealed burner gas and dual-fuel ranges, gas range tops, outdoor cooking and accessories; the Maestro Series of cooktops, electric built-in ovens and warming drawers; and the Culinarian Series of open burner gas and dual-fuel ranges and gas range tops. Circle No. 255 on Product Card CNP INDUSTRIES 351 Thor Place Brea, CA 92821 Tel: (714) 482-2320 Email: windcrest@windcrestcnp.com Web Site: www.windcrestcnp.com Types of Appliances: Cooktops, ventilation/hoods. Channels of Distribution: Appliance retailers, kitchen/bath dealers, kitchen/ bath distributors, direct to consumers. Special Services: 5-year warranty on all indoor, internally ventilated hoods. Major Products: Products from CNP include CTSG gas cooktops, with dual-port Culinary burners for precise fame control in a low profle, sleek design. Also featured are Culinary Series hoods, which are UL-listed for indoor and outdoor use. They are quality- checked at every step of the 12-step fabrication process. Circle No. 256 on Product Card COOK-N-DINE INTERNATIONAL P.O. Box 530095 Miami, FL 33138 Tel: (305) 754-3176 Email: info@cookndine.com Web Site: www.cookndine.com Types of Appliances: Cooktops, outdoor grills/BBQs, teppanyaki grill, plancha griddle. Channels of Distribution: Appliance retailers, kitchen/bath dealers, kitchen/ bath distributors. Retailer Incentives: Year-end volume rebates for live-display dealers; on-loca- tion product training; Retail Sales Person Incentive (SPIFF). Special Services: Customization and custom sizes available. Major Products: Asian-inspired, Indoor/ Outdoor Gourmet Teppan-Grills, manu- factured 100% in Germany, are designed to create social, interactive cooking spaces. Contact-temperatures from 150°F to 450°F make food preparation quick and entertaining. Unique, patented "ShallowDip-Feature" allows using liquids for sauces. Large Hot-Spot cooking cen- ter is surrounded by warming area; edges stay cool. Built-in, tabletop, free-standing, mobile models are available, and are silk-brushed, solid premium-grade 304 stainless steel. Circle No. 257 on Product Card COYOTE OUTDOOR LIVING 2615 Beltline Road, Ste. 160 Carrollton, TX 75006 Tel: (855) 520-1559 Email: info@coyoteoutdoor.com Web Site: www.coyoteoutdoor.com Types of Appliances: Outdoor grills/BBQs. Channels of Distribution: Appliance retailers. Major Products: Constructed with premium stainless steel, the CCX4 grill features 304 stainless steel burners and grates, a double-walled stainless steel hood, warming rack and interior hood lights. The grill also sports a heat control grid, which allows for even heat distribution throughout the grill and up to 20,000 BTU per burner. Circle No. 258 on Product Card Cook-N-Dine's Teppanyaki grill showcases a stainless steel teppan cooking surface. 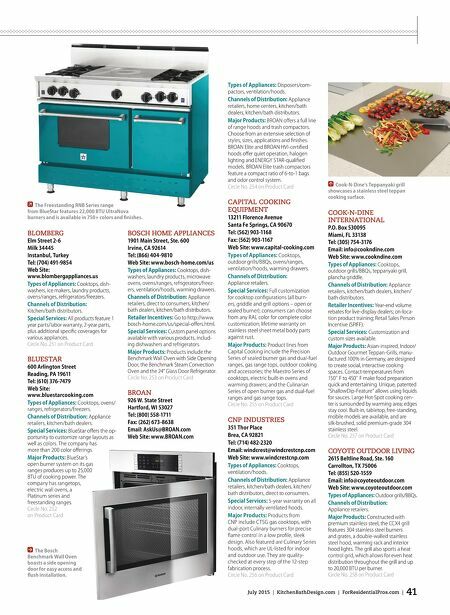 The Freestanding RNB Series range from BlueStar features 22,000 BTU UltraNova burners and is available in 750+ colors and fnishes. The Bosch Benchmark Wall Oven boasts a side opening door for easy access and fush installation.